From glistening Christmas trees and doorways donned with mistletoe, to crooning holiday music and glasses filled with mulled wine, there’s something inherently romantic about this time of year. So break out your cutest sweater and grab your boo for one (or two) of these festive date night ideas in Durham. There’s nothing classier than an evening at DPAC. They have an amazing line up of holiday shows this season including Elf the Musical, A Christmas Carol, and The Hip Hop Nutcracker. It’s a great excuse to get all dressed up. Grab dinner somewhere fancy like Vin Rogue or NanaSteak and then get cocktails after the show at Alley Twenty Six. Check out floats, hometown bands, schools, and more on Main Street at the Durham Holiday Parade. Then Fun Fest is jam packed with snow sledding, pony rides, bounce houses, visits with Santa, train rides, and music. After you enjoy the parade, head over to Cocoa Cinnamon to warm up with a latte or hot cocoa. See how Christmas was celebrated during the American Civil War at Bennett Place. There will be cooking demonstrations in the kitchen house, Christmas decorations in the main house, soldiers will demonstrate Christmas in the field and of course, a visit with Ole St. Nick. Sip on hot apple cider and share some sweet treats from the bake sale. Romantic. Visit later on in the evening for a Christmas by Candlelight Tour. Remember that awestruck feeling of seeing Christmas lights at a child? That’s what I feel like at American Tobacco Campus this time of year. Stroll through the campus and check out the displays, sip on some hot cocoa from Saladelia (if they’re open) or Beyu Cafe (just down the street) and cozy up by the fire pits. Bring back the Christmas magic at the Winter Wonderland Festival at Duke Gardens. It’s packed with winter-inspired crafts, storytelling, cookie decorating and cultural activities from around the world. Share some sweet treats and enjoy festive music with Snowdrop, the Gardens’ snowperson. Looking for something a little more chill? Head to one of Durham’s many holiday markets happening this season and see our guide to them here. You can check out local vendors and finish your shopping together without the chaos of the mall. 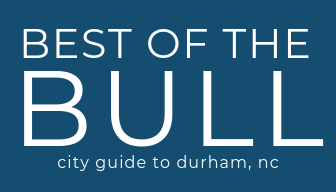 Be sure to check out Best of the Bull’s very own holiday market happening December 15th at Durty Bull Brewing. After your visit to a market, you can hop over to Quarter Horse for classic arcade games or Hi-Wire Brewing for a overly competitive game of pool soccer. There’s nothing more quintessentially holiday date cheesy than going ice skating. It’s in practically every Hallmark Christmas movie ever made. But I’ll admit, it’s pretty fun and it’s an easy excuse to hold hands. The Sportsplex is just down the road in Hillsborough. Public sessions are offered almost every afternoon, Friday night, and Saturday night. After you enjoy your skate, head over to Matthew’s Chocolates or Cup of Joe in Hillsborough to warm up with a latte.